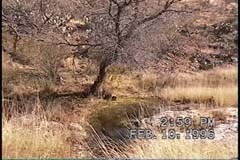 Note: we do not have many image-comparisons prepared here (though we do have one pair which is quite interesting and important). 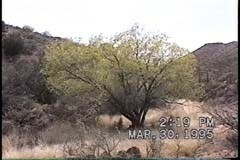 As time permits, we will scan more old video images to get a fuller set of comparisons (and, of course, continue making more precise ones in the future). 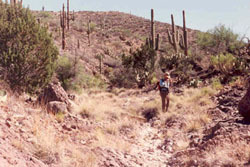 At almost the center of the left-hand image above, you can see a tiny brown pyramid. 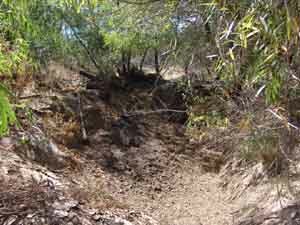 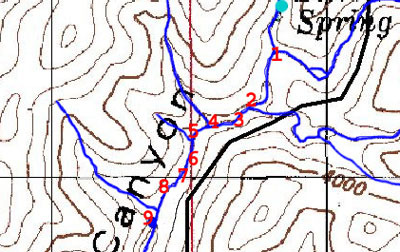 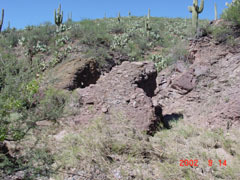 The image on the right shows a close-up of this pyramid, which indicates how high the latest flood deposited debris on the small tree in the center of the floodplain. 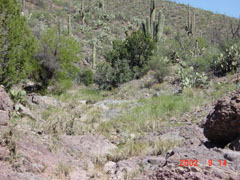 Note the rock outcrop running into the floodplain in the right-hand photo above; this is a stone's throw above photostation #06, below. 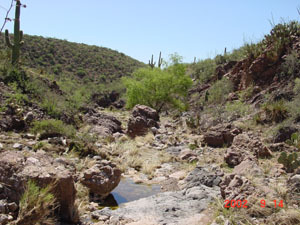 Both photographs above are looking downstream, and both show the same Cascabel Formation bedrocks at this point in the wash. 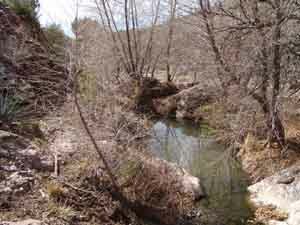 The Big Pool of Jim'sWillow Spring is visible in both photos, but the Big Cottonwood downstream from the Pool (visible in the left photo with its fallen-trunk "arch" showing almost exactly in the center of the photograph in the distance) is no longer visible, concealed by a veritable grove of Willow trees, some reaching 15-20 feet high. 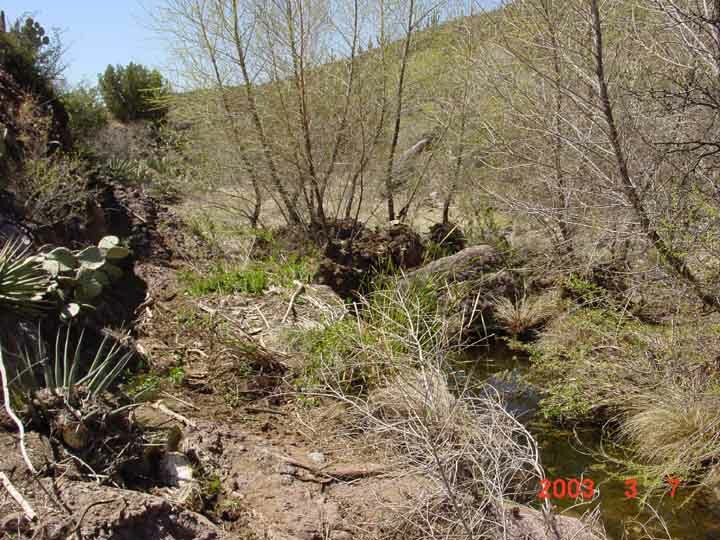 These are now catching large amounts of flood debris. 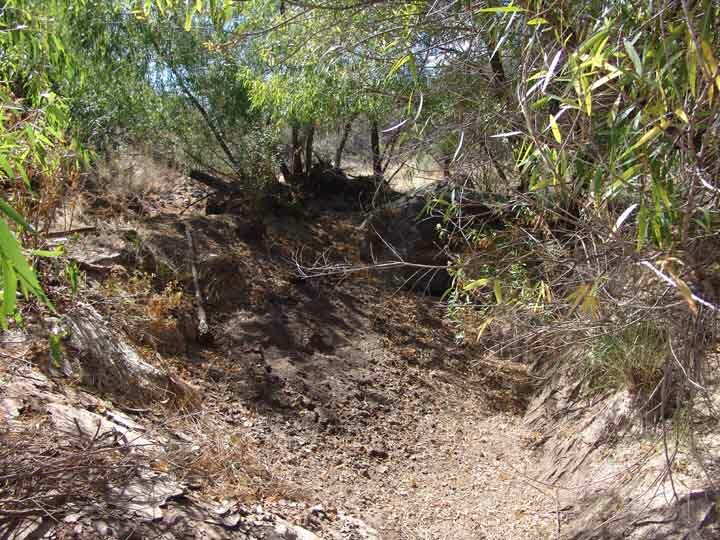 The image on the left was taken at the height of dry season, the one on the right shortly after late rains (during which the wash flooded heavily). 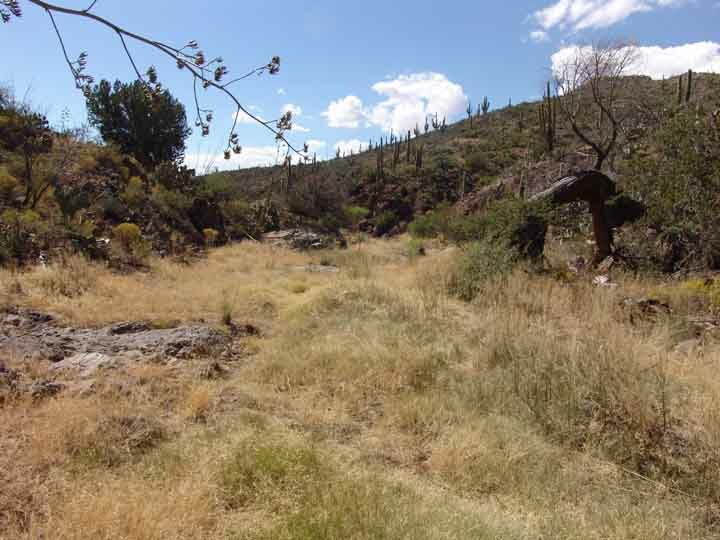 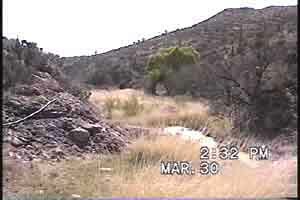 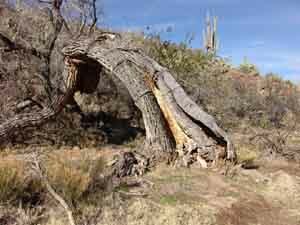 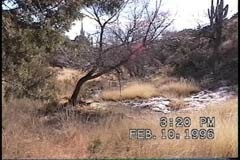 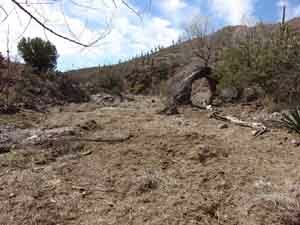 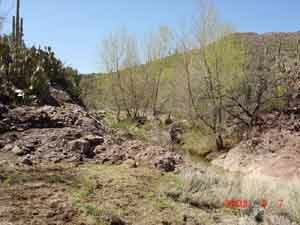 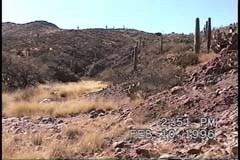 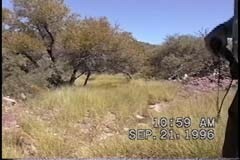 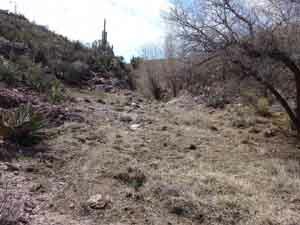 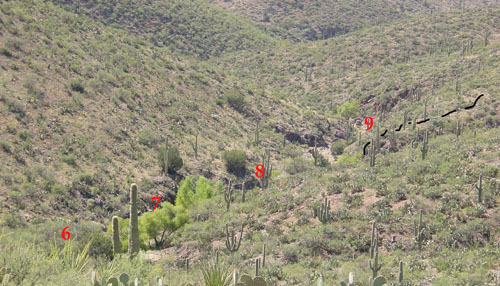 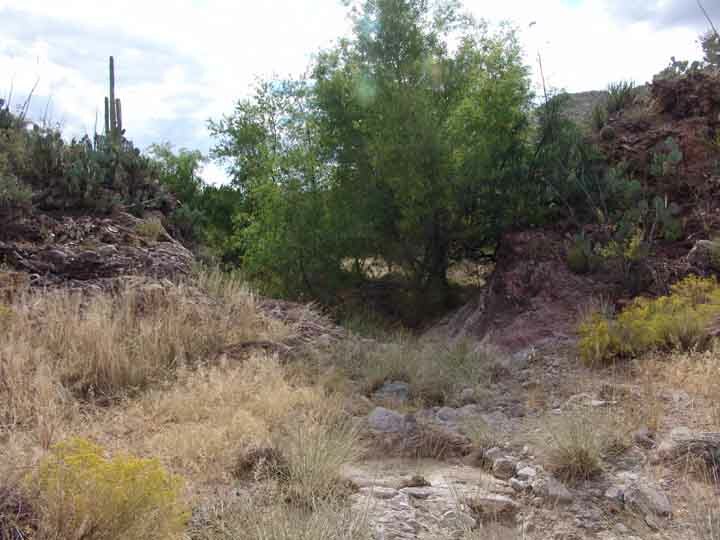 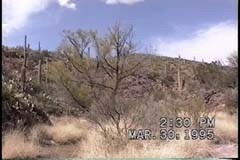 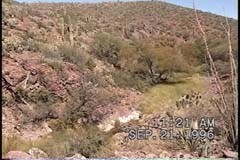 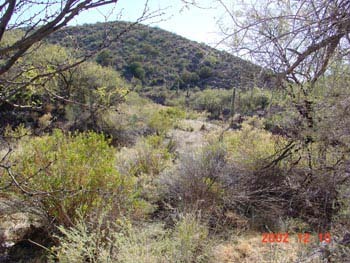 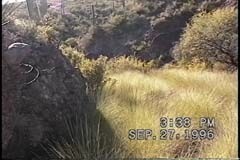 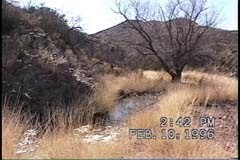 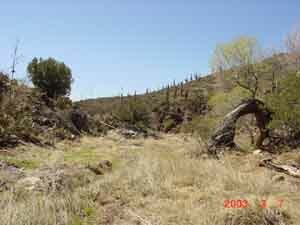 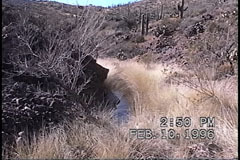 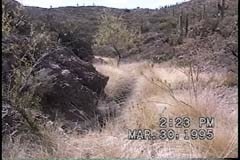 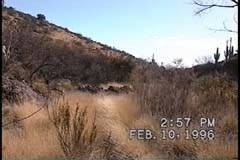 The distribution of deer grass looks very similar in the two photos -- this location is a strongly "degrading" slope of streambed, but note that one of the large saguaros in the upper right quadrant of the left-hand photo has disappeared during the 12 year interval.